The cardiologists and surgeons at Atlantic Health System Heart Care’s heart valve program, located at Gagnon Cardiovascular Institute at Morristown Medical Center, treat more valve patients than any other hospital in NJ, performing more than 900 valve operations each year and offering many catheter-based alternatives to surgery for some valve problems. 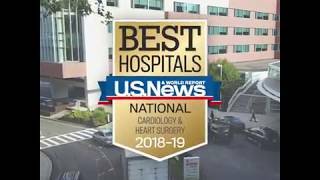 This places our program in the top three percent of all cardiac surgical programs in the United States. We are one of a few select medical centers in the United States that provide a full range of heart valve treatment options, including the ability to replace or repair the aortic valve, mitral valve and tricuspid valves through a small incision in the groin as opposed to the standard 15-inch incision down the chest. Our state-of-the-art facility features two specially designed hybrid operating suites that can be used for both complex catheter procedures and conventional open-heart and vascular surgical procedures. Transcatheter Aortic Valve Replacement (TAVR) – for patients with severe aortic stenosis, we offer a minimally invasive surgical option called TAVR – also known as transcatheter aortic valve implantation (TAVI). As one of the first hospitals to offer this surgery, our surgeons have performed more than 400 TAVR procedures. Transcatheter Mitral Valve Replacement (TMVR) – we offer transcatheter mitral valve replacement for patients with mitral valve stenosis or regurgitation. Transcatheter Tricuspid Valve Repair (TTVR) – we offer transcatheter tricuspid valve repair (TTVR) for patients with tricuspid valve regurgitation. These non-surgical techniques can be life-saving for those considered moderate to high-risk for surgical replacement. Minimally invasive surgery enables patients to undergo advanced cardiovascular repair with shorter recovery times. As a leader in heart valve device research, we continue to advance the treatment of valve disease. Our specialists are frequently selected to participate in groundbreaking clinical trials that evaluate next generation procedures and techniques for valve repair. Our expertise is widely sought, and we now train surgeons and interventional cardiologists across the United States and South America. Please use the form to request more information. All fields are required. We have earned numerous awards and accreditations for our diagnostics and treatment of cardiovascular disease. Provides care for women who have known or suspected heart disease. Interested in joining a monthly support group for heart disease patients and caregivers? Morristown Medical Center was the first hospital in New Jersey to offer the TAVR approach for aortic stenosis, which allows the aortic valve to be replaced without open-heart surgery. Our surgeons have performed more than 400 TAVR procedures.